In response, Dr. Schweitzer and her colleagues performed more studies on the soft tissues in question.4,5They even extracted collagen from a tyrannosaur leg bone and found a protein match of about 58% with bird collagen and 51% with frog and newt collagen—evidence these samples couldn't be from contamination. In further support that these are real dinosaur organic tissues, another study examined 89 amino acids extracted from a T. rex specimen, finding perfect matches with some modern animal proteins. Schweitzer's team has essentially demonstrated the "impossible." These dinosaur soft tissues are real! However, once again critics claim that these discoveries may not be melanosomes after all, but are just microbes that look like melanosomes, since both are similar in size and shape.10 One way to more clearly distinguish between melanosomes and microbes is to find keratin associated with the melanosomes. 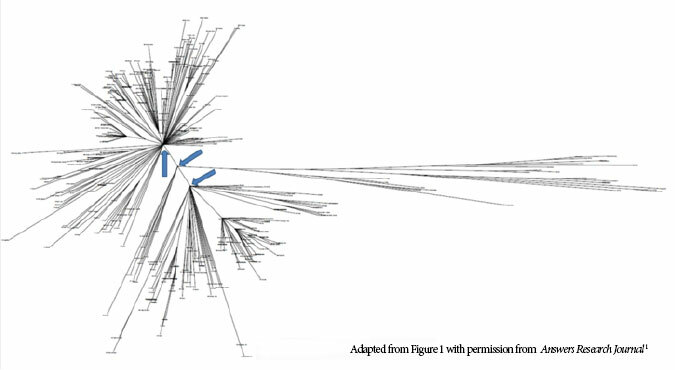 Keratin is a protein that surrounds modern feather melanosomes. The discovery of melanosomes and keratin together would resolve the dilemma. Since microbes are not found embedded in keratin, both the melanosomes and associated keratin would logically have to come from the fossilized (but not mineralized) bird. Pan's team concluded, "Our work represents the oldest ultrastructural and immunological recognition of avian beta-keratin from an Early Cretaceous (~130-Ma) bird. "10 In other words, the melanosomes and keratin found in this ancient bird are clearly real. Their discovery again demonstrates the presence of preserved original proteins in fossils claimed to be many millions of years old. And yet, the authors offer no testable explanation for this preservation "miracle." Instead, they hypothesize that calcium, possibly mediated by bacterial activity, might have helped preserve the organic molecules. 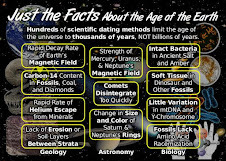 And yet, they found no calcium in the rock matrix surrounding the fossil, leaving any such source of calcium a mystery.10 Their hypothesis is a speculation without substance. Secular science still has found no viable explanation for how these proteins were preserved. They maintain the fossils are millions of years old, in spite of the contrary data. The case for thousands and not millions of years is growing stronger with each of these new finds. Schweitzer, M. H., et al. 2005. Soft Tissue Vessels and Cellular Preservation in Tyrannosaurus rex. Science. 307 (5717): 1952-1955. Pan, Y., et al. 2016. Molecular evidence of keratin and melanosomes in feathers of the Early Cretaceous bird Eoconfuciusornis. Proceedings of the National Academy of Sciences of the United States of America. doi: 10.1073/pnas.1617168113. Kaye, T. G., G. Gaugler, and Z. Sawlowicz. 2008. Dinosaurian soft tissues interpreted as bacterial biofilm. PLOS ONE. 3 (7): E2808. Schweitzer, M. H., et al. 2007. Analyses of Soft Tissue from Tyrannosaurus rex Suggest the Presence of Protein. Science. 316 (5822): 277-280. Asara, J. M., et al. 2007. Protein Sequences from Mastodon and Tyrannosaurus rex Revealed by Mass Spectrometry. Science. 316 (5822): 280-285. Zhang, F., et al. 2010. Fossilized melanosomes and the color of Cretaceous dinosaurs and birds. Nature. 463 (7284): 1075-1078. Carney, R. M., et al. 2011. New evidence on the colour and nature of the isolated Archaeopteryx feather. Nature Communications. 3 (637): doi: 10.1038/ncomms1642. Li, Q., et al. 2012. Reconstruction of Microraptor and the Evolution of Iridescent Plumage. Science. 335 (6073): 1215-1219. Lindgren, J., et al. 2014. Skin pigmentation provides evidence of convergent melanism in extinct marine reptiles. Nature. 506 (7489): 484-488. Moyer, A. E., et al. 2014. Melanosomes or Microbes: Testing an Alternative Hypothesis for the Origin of microbodies in Fossil Feathers. Scientific Reports. 4 (4233): doi:10.1038/srep0433. Clarey, T. 2015. Dinosaurs: Marvels of God's Design. Green Forest, AK: Master Books, 49. Image credit: Copyright © 2016 X. Wang. Adapted for use in accordance with federal copyright (fair use doctrine) law. Usage by ICR does not imply endorsement of copyright holders. *Dr. Clarey is Research Associate at the Institute for Creation Research. Article posted on December 12, 2016. In October we were thrilled to take part in a rim tour and Colorado River float of the Grand Canyon with Russ Miller of Creation Ministries and Jay Seegert of The Starting Point Project. Russ stressed over and over again the significance of Red Butte, just south of Grand Canyon. ICR wrote a short article highlighting this significance. Enjoy! Sixteen miles from Grand Canyon's south rim, a cone-shaped butte rises like a lone sentinel 1,000 feet above the Coconino Plateau floor. Thousands of tourists rush past on Arizona Highway 64 without giving it another thought, yet this humble little hill testifies to a remarkable past. Red Butte is composed of flat-lying shales of the Moenkopi Formation, overlain by Shinarump Conglomerate of the Chinle Formation. Continuous exposures of these two formations are not found for tens of miles around, yet they occur here. These strata sit on a foundation of flat-lying and resistant Kaibab Limestone, the rim rock for most of Grand Canyon and surface of the Coconino Plateau. A basalt (lava) flow tops the butte, protecting the softer layers below from erosion. Lava ordinarily flows downhill, so how did it get on top? Answer: it flowed onto a surface that was once 1,000 feet higher than the present Coconino Plateau! 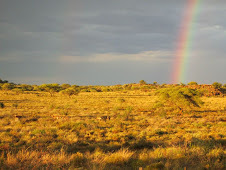 Strata of the Moenkopi, Chinle, and perhaps other formations were stripped away by erosion. Red Butte stands as the most prominent vestige of this once continuous layer. A global Flood may provide the framework for a more credible depositional model. During the Flood, sediment-choked waters deposited 1,200 meters of flat-lying "Grand Canyon strata" and around 4,000 meters of Mesozoic strata (seen today atop Utah's Grand Staircase to the north, and Arizona's Black Mesa to the east). The unique vertical movements in the earth's crust during the Flood's retreat4 uplifted the region, and an enormous quantity of soft sediment was removed from its top--a volume far greater than that excavated from Grand Canyon proper.5 Red Butte is a tiny remnant from this vast erosion. When the strata gained sufficient internal strength to stand as near-vertical walls, Grand Canyon itself was incised into the plateau. Ager, D. 1993. The Nature of the Stratigraphical Record, Third Edition. New York: John Wiley & Sons. Doelling, H. et al. 2000. Geology of Grand Staircase-Escalante National Monument, Utah. In Sprinkel, D.A. et al (eds. ), Geology of Utah's Parks and Monuments, Utah Geological Association Publication 28. Salt Lake City: Utah Geological Association, 189-231. Anderson, P.B. et al. 2000. Geology of Glen Canyon National Recreation Area, Utah-Arizona. Ibid, 301-335. "At thy rebuke [the waters] fled….They go up by the mountains; they go down by the valleys unto the place which thou hast founded for them" (Psalm 104:7-8). The Hebrew text suggests vertical movements in the earth's crust whereby the mountains went up and the valleys went down, allowing the Flood waters to retreat. Mesozoic strata are conspicuously or nearly absent for an estimated 9,000 square kilometers around Grand Canyon, though they are present to thicknesses in excess of 4 kilometers in the adjacent Grand Staircase and Black Mesa regions. Erosion is estimated to have removed 36,000 cubic kilometers, dwarfing the approximately 4,000 cubic kilometers excavated from Grand Canyon (see Steven A. Austin's book Grand Canyon: Monument to Catastrophe, available at www.icr.org/store). A tour of the Grand Canyon region will be conducted by ICR scientists April 11 to 20, 2008. * Mr. Hoesch is Research Assistant in Geology. Cite this article: Hoesch, W. 2008. Red Butte: Remnant of the Flood. Acts & Facts. 37 (3): 14. Dinosaur Fossils in These Rock Layers? Cite this article: Tim Clarey, Ph.D. 2015. Dinosaur Fossils in Late-Flood Rocks. Acts & Facts. 44 (2). Evolutionary scientists view Earth’s rock layers as a chronological record of millions of years of successive sedimentary deposits. 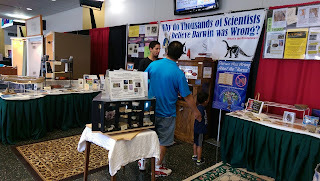 Creation scientists, on the other hand, see them as a record of the geological work accomplished during the great Flood’s year-long destruction of the Earth’s surface. If that is the case, though, why don’t we find dinosaur fossils in the earliest North American Flood sediment layers—why do we find them only in later Flood rocks? The ICR team’s recent examination of sedimentary rock layers across the United States and Canada seems to provide an answer. Deposition of the earliest Flood sediments (the Sauk, Tippecanoe, and Kaskaskia Megasequences) was thickest in the eastern half of the U.S.—often deeper than two miles! In contrast, the early Flood deposits across much of the West are commonly less than a few hundred yards deep, and in many places there was no deposition at all (Figure 1). It seems the dinosaurs were able to survive through the early Flood in the West simply because they were able to congregate and scramble to the elevated remnants of land—places where the related sedimentary deposits aren’t as deep—as the floodwaters advanced. I call this high ground Dinosaur Peninsula. In this way, dinosaurs were able to escape burial in the early Flood. However, later in the Flood (during deposition of the Absaroka and Zuni Megasequences) things changed dramatically. Pangaea, the former supercontinent made up of all of today’s continents, began to break up. This change in tectonics, combined with increasing water levels, caused great changes in the ways that the rock layers were deposited. Violent, tsunami-like waves washed across western North America while virtually no sedimentation was occurring in the East. This is a complete reversal of the pattern observed earlier in the Flood. Rock sequence data show that more than three miles of sediment rapidly accumulated across the American West during the Absaroka and Zuni Megasequences.1 This apparently overwhelmed and buried the Triassic, Jurassic, and Cretaceous dinosaurs that couldn’t escape the Flood. As the waters rose, Dinosaur Peninsula began flooding from south to north. We also find the largest herds of dinosaurs, in the form of dinosaur fossil graveyards, in the Upper Cretaceous system sediments in northern Wyoming, Montana, and Alberta, Canada. It’s as if the dinosaurs were fleeing northward up the peninsula as the waters advanced from the south. By day 150 of the Flood (Genesis 7:24), even the Uplands area to the north, in present Canada, was covered by the floodwaters (Figure 1). In his book Digging Dinosaurs, American paleontologist John R. (Jack) Horner reported the discovery of a huge dinosaur graveyard—over 10,000 adult Maiasaura in a small area, and yet no young were mixed in with them.2 What could have caused this odd sorting? In a Flood model, this is easily explained: The adult dinosaurs were likely stampeding away from the imminent danger of raging floodwaters; their young could not keep up and became engulfed in some lower part of the peninsula. More research is being done on the stages of the Flood and the order in which the continents were submerged. But each answer provides new insight into the great catastrophe that forever altered the topography of our world. The data are taken from stratigraphic rock columns, outcrops, and holes bored deep in the earth to examine the different rock layers. To know the dimensions of megasequences, we have to look at many of these columns across a given area. Horner, J. R. and J. Gorman. 1988. Digging Dinosaurs. New York: Workman Publishing, 128. * Dr. Clarey is Research Associate at the Institute for Creation Research and received his Ph.D. in geology from Western Michigan University. Back in 2003, ICR founder Dr. Henry Morris explained a few ways evolutionists themselves criticized the use of the peppered moth as an example of evolutionary beliefs.1 New genetic research validates those criticisms. The moth earned fame as a key player in a classic evolutionary story in the late 19th century. In England, a population of peppered moths supposedly shifted their coloring from mostly white to mostly black after soot from the industrial revolution darkened their tree-trunk homes. According to the tale, bird predators had a difficult time seeing the now-camouflaged dark moths, so those moths began to thrive. 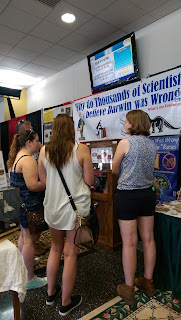 That story helped rescue Darwin's conception of natural selection from a round of early 20th century criticisms, such as a lack of supporting field evidence. However, later researchers could not replicate the peppered moth results. Other investigators discovered that most of the story's facts were essentially wrong. For example, peppered moths live mostly beneath leaves, not on tree trunks. One researcher staged photos of the moths on sooty trunks—not where moths naturally rest. In other words, what began as a population of light and dark moth varieties existed through the industrial revolution as a population of light and dark moth varieties. No net evolution occurred. And that's essentially what geneticists confirmed in their new study. Publishing in Nature, biologists centered at the University of Liverpool discovered that a well-known form of genetic shuffling, involving a transposable element (TE), generated the dark versions of these moths.3 The researchers' diligent labors revealed that, at some point in the past, a 21,925 nucleotide-long segment of DNA was inserted into a gene that embryonic moths access during development. The study authors wrote, "The insert was found to be present in 105 of 110 fully black moths (wild caught in the UK since 2002) and absent in all (283) typica [white moths] tested. "3 Clearly, even a century or so afterEngland cleaned the soot off its tree trunks, both black and white moth varieties still thrive just fine in the wild. What mechanism generated the dark moth variety? Natural selection does not fit the bill. At best, death of "unfit" moths would merely reduce color variations, not generate new ones. So, in the beginning the Creator endowed moths with the genetic potential for future generations to generate dark varieties. Peppered moths never illustrated evolution in action. But now, more than ever, they clearly expose genius creativity. Morris, H. 2003. 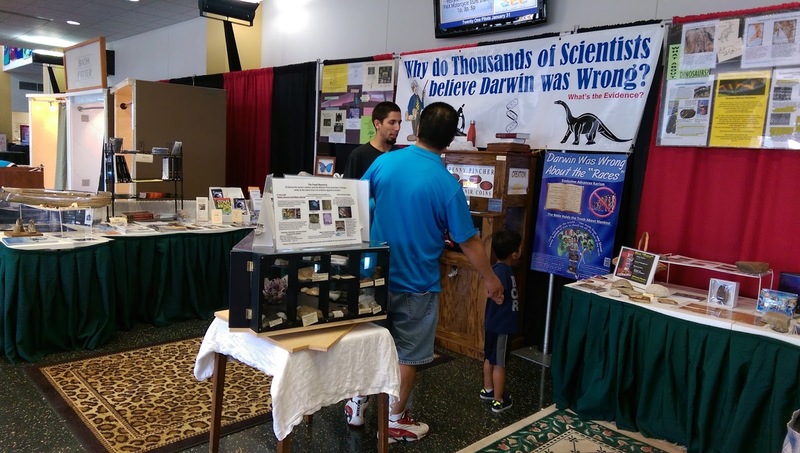 Evolutionists and the Moth Myth. Acts & Facts 32 (8). Hooper, J. 2002. Of Moths and Men. New York: W.W. Norton and Co.
Van't Hof, A. E. et al. 2016. The industrial melanism mutation in British peppered moths is a transposable elementTE. Nature. 534 (7605): 102-105. Kunarso, G. et al. 2010. Transposable elements have rewired the core regulatory network of human embryonic stem cells. Nature Genetics. 42 (7): 631-634. A hiccup in healthy cell processes that randomly pasted the 21,925-long TE into this particular gene would justify the Nature study authors calling it a "mutation." However, processes could have pasted the TE into this gene as part of an internal variation-generating protocol. But this implies ingeniously designed automated genetic-script editing. The team did not test these options, but whether the TE placement happened by accident or design, the cut-and-paste process itself followed a focused strategy using cellular machinery and protocols. Image credit: © 2011. M. Henderson. Adapted for use in accordance with federal copyright (fair use doctrine) law. Usage by ICR does not imply endorsement of copyright holders. Article posted on August 4, 2016. Non-stop. 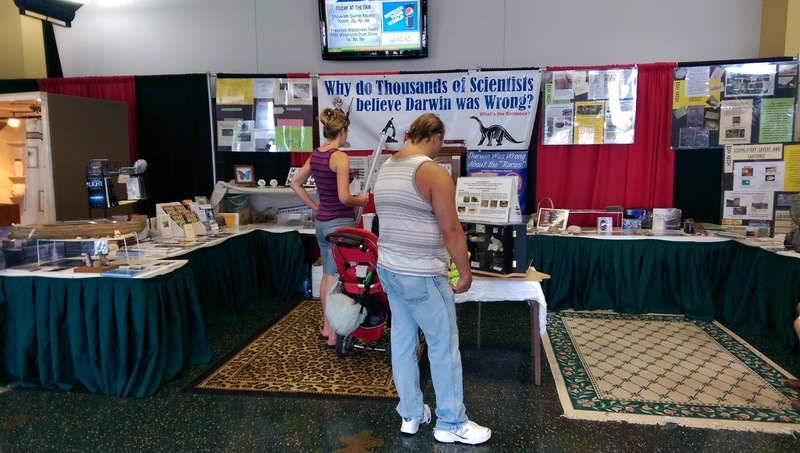 That describes the activity at the Dane County Fair yesterday. Great conversations, sharing evidences, sharing Christ, answering questions, talking about the Flood, fossils, creation, God's Word. Wow, Three of us were so busy reaching out. It was a great day. 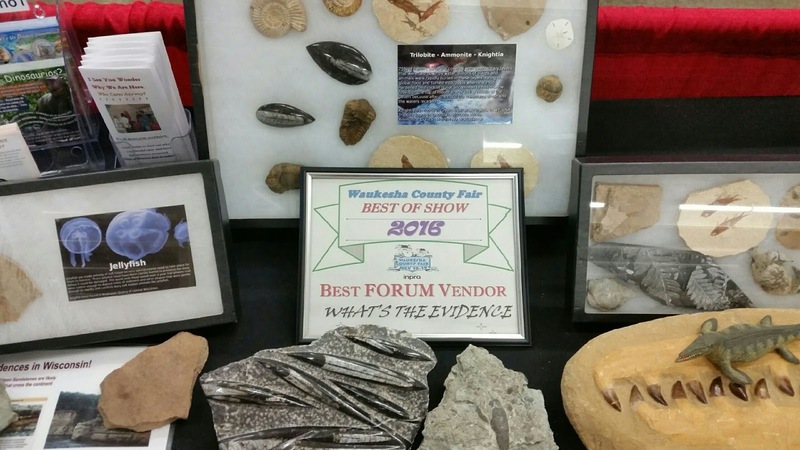 I heard the booth in Waukesha was also busy, plus they received an award for their booth! Enjoy the pictures and keep praying for folks who come to the booth as well as the workers. 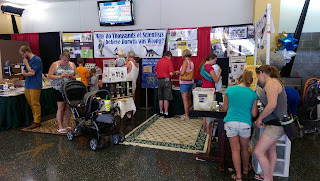 We are only half way through fair season! To God be the glory. Ryan was such a blessing and help! Discussion about the "Races" of mankind. Lucy, to TV audiences of the 1950s and 1960s, was a spunky red-headed actress. To our more educated schoolchildren today, however, “Lucy” means somethingquite different. She is the celebrated fossil that appears in textbooks as a hairy, seminaked, upright-walking ape striding boldly across a treeless African landscape. Her jaw is set and she leaves behind her a set of trailing footprints. As the unquestioned icon of human evolution, her fame is comparable to that of the former actress. Why is it that all public school children have heard of this fossil? Let us consider Lucy and her species, Australopithicus afarensis. The human evolution story usually begins with the more primitive australopithocines (literally, “southern apes”) that transition into the genus Homo (or human), through either Homo habilis or Homo erectus, depending on who you talk to. Homo habilis is a mixed taxon of both human and ape remains, and has fallen into disrepute. As for Homo erectus, a great many suggest this category be subsumed into Homo sapiens. Thus “Lucy” and the afarensis fossils occupy a critical place in the human evolution story, squarely between that of the truly apish australopithocines and humans. Lucy’s skeleton was about 40% complete and was a remarkable discovery when unearthed by Don Johanson in 1974. The creature would have stood 3.5 feet tall, about the height of a chimpanzee. Its skull was grossly ape-like, and also about the size of a chimp’s, with very little in the way of human-like features. Lucy possessed very long fingers with a decided curve to them, like modern apes possess for tree-swinging activities. From other A. afarensis finds, it is believed Lucy possessed long toes with a curvature that also I Love Lucy? suggested prehensile and arboreal behavior. Lucy’s upright-turned shoulder joint enabled suspensory behavior and her hands, wrists, and arms were powerfully prehensile. And so you ask, what makes Lucy such a great missing link? Angles of bones in the (reconstructed) hip joint and knee joint suggest that Lucy spent part of her time walking upright. That is as strong as the evidence gets that she was related to humans. Virtually no anatomists will support Johanson’s claim that Lucy was a habitual upright walker, yet this is what most textbooks boast. There is one more piece of evidence that has been used to argue that Lucy was an upright walker: the Laotoli footprints. In strata comparable in age to those from which Lucy came are a set of very well defined fossil footprints. Remarkably, anatomists are unanimously agreed that the footprints are indistinguishable from those made by modern man on a beach. Rather than admit this as evidence that man and Lucy lived side-by-side in the past, it is claimed that an ape like Lucy must have made the footprints because “we all know” that man hadn’t evolved yet. This, despite the fact that it is almost inconceivable that an austro-lopithocine foot could have done it! It is only by circular reasoning that this can be admitted as evidence for human evolution yet this is exactly what is being done in our public schools today. If you want to know why Lucy is hailed the greatest of missing links it is because she is the best the evolutionist can come up with! There can be no other explanation. It is a credit to an educational establishment that banks on the ignorance of taxpayers that Lucy remains a “missing link. Does Science Confirm the Bible's History? You Bet! Evolutionary teachings hold that all mankind arose from a population of ape-like ancestors from which chimpanzees also evolved. But Genesis, the rest of the Bible, and Jesus teach that all mankind arose from Noah's three sons and their wives. A new analysis of human mitochondrial DNA exposes two new evidences that validate the biblical beginnings of mankind. Assuming that God placed the ideal mtDNA sequence into Eve, all those differences arose by mutations since the Genesis 3 curse, about 6,000 years ago. Other scientists measured the rate at which these copying errors occur. Though very slow—we acquire about one mutation every 6 generations—a few dozen mutations could appear after several millennia. This sets the stage for researchers to compare competing models' predictions against measured mtDNA differences. Bible-believing molecular biologist Dr. Nathaniel Jeanson downloaded publically available human mitochondrial genome sequence data to do exactly that. Publishing inAnswers Research Journal, his results show that the number of today's mtDNA differences exactly matches the number predicted by the Bible's 6,000 years of human history.1 Mitochondrial DNA from around the world shows no trace of the 200,000 or so years' worth of mutations that the evolution model predicts. Geneticists construct tree diagrams using software that places the most similar genetic sequences near one another, and the most dissimilar sequences on the longest branches. Jeanson found at least two distinct patterns in the human mtDNA tree diagram that confirm Genesis. The center of the diagram shows three main trunks. Each reflects a specific mtDNA sequence with only a handful of differences from the other two. Could these three trunks represent the unique mtDNA from the wives of Shem, Ham, and Japheth? A second pattern emerges that also fits the three wives explanation. Assuming longer times between each generation, according to the biblical record of lifespans before the Flood, and using today's slow mutation rate, the 1,656 years between Adam and Noah would have produced the small number of differences that the short lines between each trunk represent. This study produced two Genesis-confirming results. First, the human mtDNA tree has three trunks, which fits the Genesis model that all peoples descended from three foundational mothers—the wives of Shem, Ham, and Japheth. 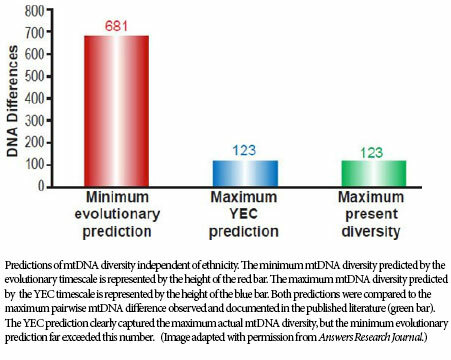 Second, 6,000 years of today's slow mutation rate would exactly produce today's measured number of mtDNA differences. 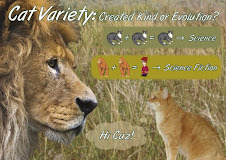 Genetics again confirms Genesis. Jeanson, N.T. 2016. On the Origin of Human Mitochondrial DNA Differences, New Generation Time Data Both Suggest a Unified Young-Earth Creation Model and Challenge the Evolutionary Out-of-Africa Model. Answers Research Journal. 9 (2016): 123-130. Article posted on May 16, 2016. Creationists are often asked, “How is it possible for the earth’s population to reach 6.5 billion people if the world is only about 6,000 years old and if there were just two humans in the beginning?” Here is what a little bit of simple arithmetic shows us. SIMPLE, CONSERVATIVE ARITHMETIC REVEALS CLEAR MATHEMATICAL LOGIC FOR A YOUNG AGE OF THE EARTH. After 32 doublings, which is only 4,800 years, the world population would have reached almost 8.6 billion. That’s 2 billion more than the current population of 6.5 billion people, which was recorded by the U.S. Census Bureau on March 1, 2006.2 This simple calculation shows that starting with Adam and Eve and assuming the conservative growth rate previously mentioned, the current population can be reached well within 6,000 years. We know from the Bible, however, that around 2500 BC (4,500 years ago) the worldwide Flood reduced the world population to eight people.3 But if we assume that the population doubles every 150 years, we see, again, that starting with only Noah and his family in 2500 BC, 4,500 years is more than enough time for the present population to reach 6.5 billion. FROM TWO PEOPLE, CREATED ABOUT 6,000 YEARS AGO, AND THEN THE EIGHT PEOPLE, PRESERVED ON THE ARK ABOUT 4,500 YEARS AGO, THE WORLD’S POPULATION COULD EASILY HAVE GROWN TO THE EXTENT WE NOW SEE IT—OVER 6.5 BILLION. This figure is truly unimaginable, for it is billions of times greater than the number of atoms that are in the entire universe! Such a calculation makes nonsense of the claim that humans have been on earth for tens of thousands of years. Simple, conservative arithmetic reveals clear mathematical logic for a young age of the earth. From two people, created around 6,000 years ago, and then the eight people, preserved on the Ark about 4,500 years ago, the world’s population could have grown to the extent we now see it—over 6.5 billion. With such a population clearly possible (and probable) in just a few thousand years, we could actually ask the question, “If humans were around millions of years ago, why is the population so small?” This is a question thatevolution supporters must answer. 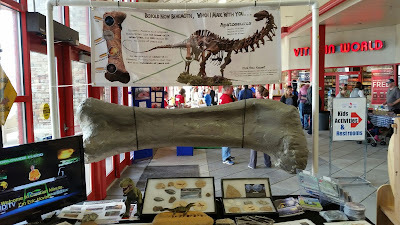 We've dressed up our Apatosaurus femur bone display with this new banner. 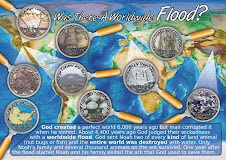 It explains some of the evidences for "recent" burial of dinosaurs in the flood of Noah's time, i.e. osteocytes and red blood cells in dinosaur bones, and C14 still in dinosaur bones. If dinosaurs have been extinct for millions of years, the bones would be rock solid (or decayed), and could not have fresh tissue still inside them. It all points to exactly how the Bible recounts the history of both man and dinosaurs. Both were created on Day 6, both were originally plant eaters (there was no death in the prefect Garden), and both have been corrupted and cursed due to sin. What a magnificent creature the Apatosaurus must have been. And what a Great God we serve, who left their bones in the earth to remind us of his righteous judgment and the salvation he offered those in Noah's day by the Ark. Today we know Jesus is our Ark of Salvation, keeping us safe from God's judgment if we'll only trust him! ICR is ready! The ICR Museum of Science and Earth History will be the culmination of decades of study and research. God has opened the door to make this a reality. History of Science—Learn the keys of the scientific method and how following them leads to discoveries that confirm Scripture. Origin of the Universe—Explore the wonders of the universe and learn about big problems with the Big Bang. Garden of Eden—Feel the majesty of the stunning display of variety and created kinds in God’s “very good” creation. DNA—Discover what cutting-edge research reveals about humans, chimps, and genomic studies. See how science reveals the flaws in evolutionary theory. Noah’s Ark and the Flood—Step into the Ark and experience evidence for the worldwide Genesis Flood in an immersive Ark exhibit. Grand Canyon—Peer into Grand Canyon and learn how geologists uncover the mysteries of the past. See how Mount St. Helens provides clues to the present. Dinosaurs—Interact with dinosaur holograms. Explore the science of soft-tissue research. Discover the truth behind the behemoth and leviathan. 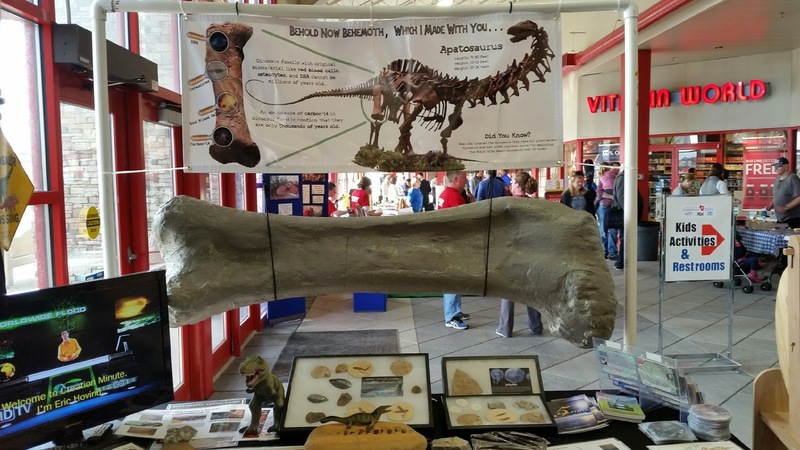 Fossils and Buried Clues—Become a paleontologist as you go on a fossil dig! The Ice Age and Ice Age Theater—Experience the Flood causing a massive Ice Age. Stand between the tusks of a life-size wooly mammoth! 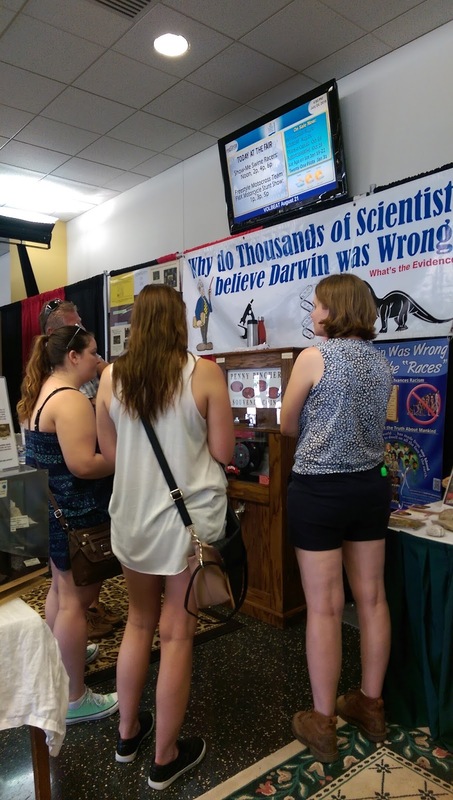 Interactive Exhibits and More—New research, fresh discoveries, and opportunities to explore science further will be constantly changing—a new experience on each visit. Planetarium—Travel the stars in a 3-D planetarium. Watch how God designed order and creativity among the cosmos. Auditorium—Expert presentations by ICR scientists with the latest research. Museum Store—Equip yourself with resources and refuel with a light snack and drink. Outdoor Park—Relax, eat, or play in a beautiful, picturesque park surrounded by life-size dinosaurs.